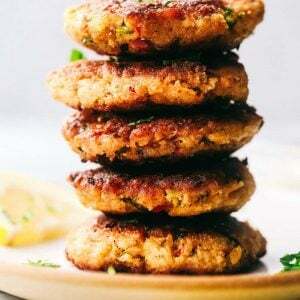 Salmon Croquettes are pan fried and packed with so many great flavors. 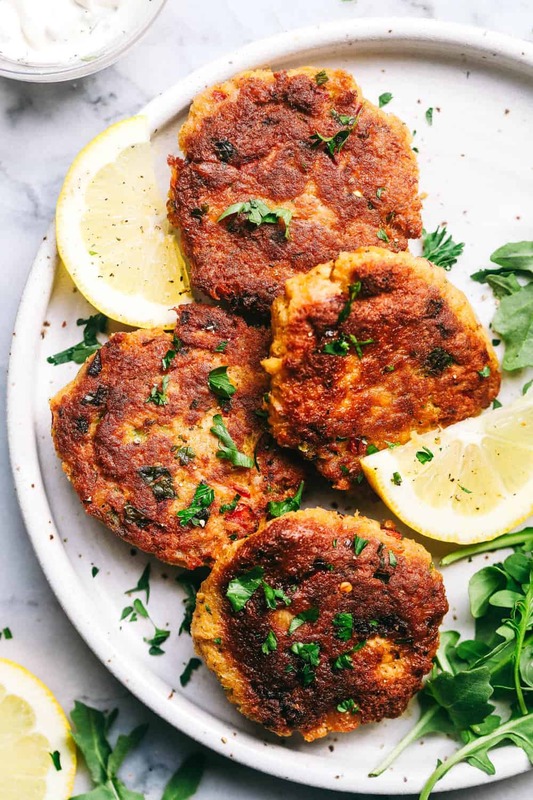 These make a quick and easy weeknight meal and are delicious with a tartar sauce! Salmon is one of my favorite things to make. For some more easy salmon recipes, be sure to make: Garlic Brown Sugar Glazed Salmon, Sheet Pan Thai Salmon, or this Baked Sesame Teriyaki Salmon. The weather just made a shift and it has been pretty cold and rainy at our house. I actually have been ready for the weather to cool down a bit and to be able to cozy up and wear my fall sweaters. Whenever it is rainy or cloudy outside, I am not able to really work or take pictures of food for the blog. This gives me a chance to have a meal ready for the family every night despite how busy things get. Since I am a salmon lover, I LOVE salmon croquettes. The best part about these delicious croquettes is that my kids will eat them and not even realize that they are salmon. They are fast and easy and such a win at our house! 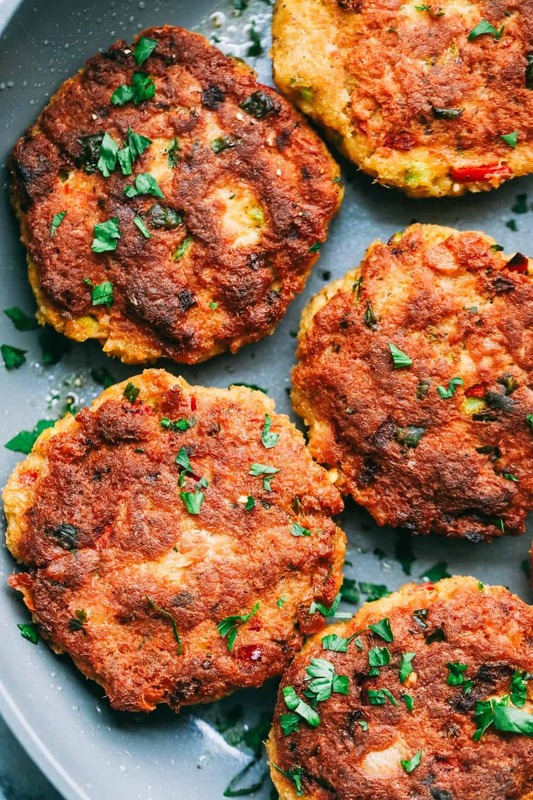 Salmon Croquettes are made with canned salmon, chopped peppers, egg, and Panko and made into a patty. They are pan fried on each side in a medium sized skillet until golden brown. How do you make salmon croquettes? To start, add panko and flour to a bowl and mix. Add bell peppers, canned salmon, garlic, salt, pepper, egg, mayonnaise, Worcestershire sauce and cilantro. Mix until incorporated. Shape into 6-8 patties and heat oil in large skillet over medium high heat. Add patties to the skillet and cook for 2-3 minutes on each side or until golden brown. 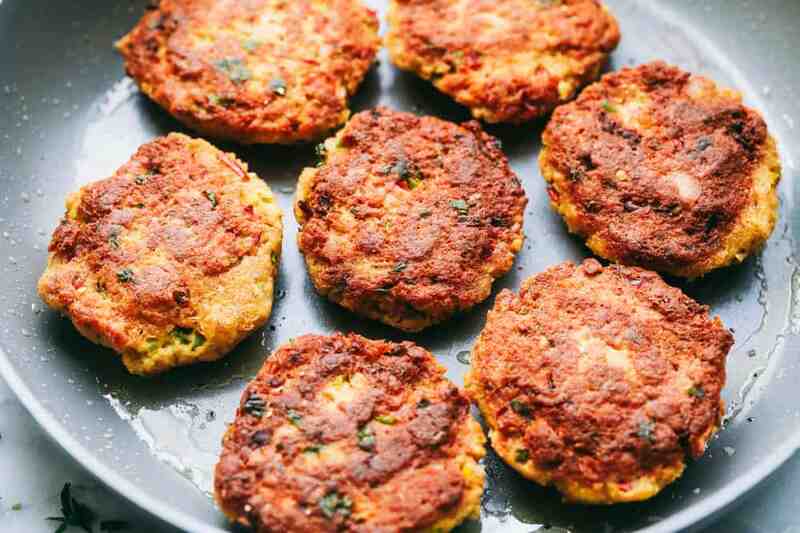 Can I bake salmon croquettes? Yes you can! Bake for 10 minutes flipping once until they are cooked throughout and golden brown. What sides go well with salmon croquettes? Looking for even more delicious salmon recipes? Look no further! Add panko and flour to a bowl and mix. 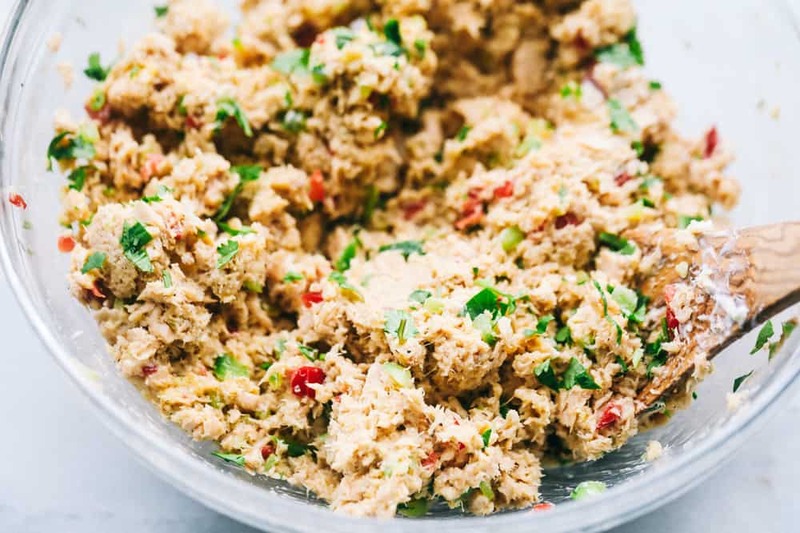 Add bell peppers, canned salmon, garlic, salt, pepper, egg, mayonnaise, Worcestershire sauce and cilantro. Mix until incorporated. Hi Alyssa! First of all, I LOVE your recipes. I have tried many of them and those are so simple and delicious! Here is my question: my husband does not like salmon, can i replace the salmon for tuna for the salmon croquettes? Any suggestion is more than welcome. Thank you! 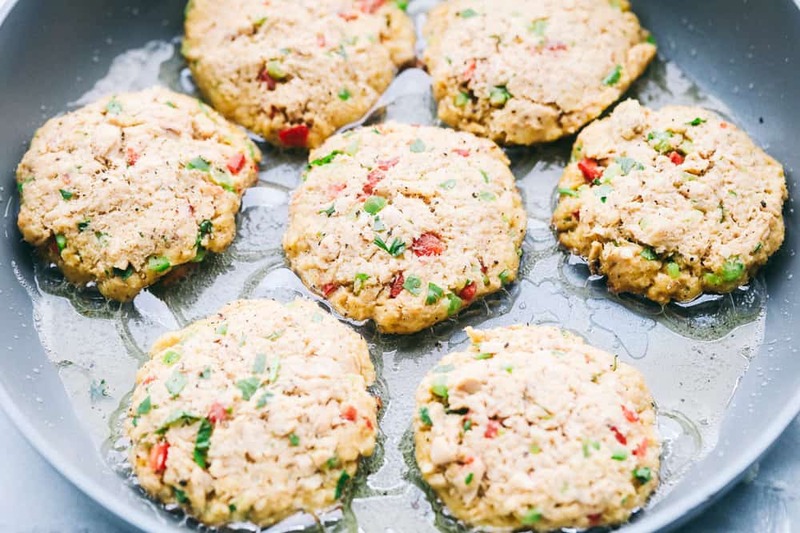 In answer to your question…..I have made these with tuna as well as with salmon & they both turned out great. Just be sure to measure the equal amount of tuna as the can of salmon. I flaked my tuna a bit tho. Also – (just my preference) I did not add the chopped green & red peppers, but I did add some dried celery flakes. Either way is just delicious! Yes you can flake the tuna so other items will stick to it. Crab meat will work too. This looks terrific! Any ideas how to get a similar crunchiness for a gluten free version? 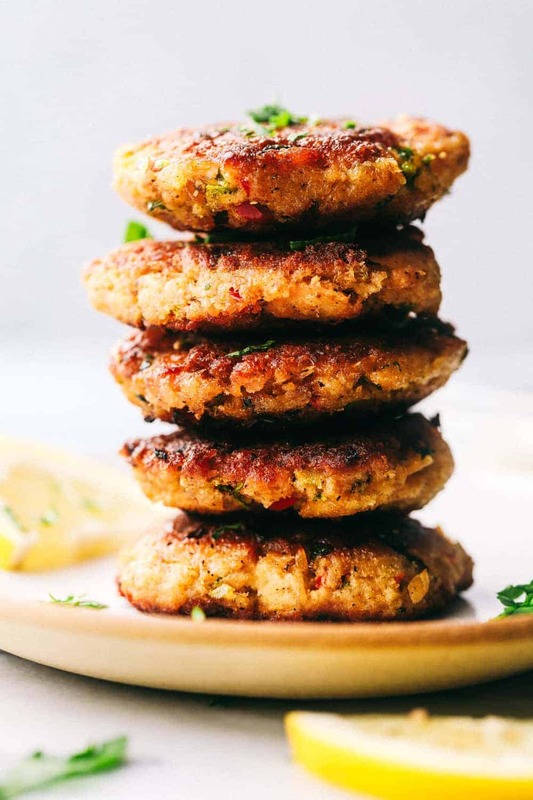 Your recipes on salmon Croquettes look mighty good. I would love to print them. I want to cook them in a Nuwave air cooker with a light spray of Olive oil. Will let you know how they turn out. That sound fantastic! Thank you so much!